Arranged in a four-way battle for the World Driver's Championship, the 2010 Abu Dhabi Grand Prix will resolve whether it will be the Ferrari's Fernando Alonso, the McLaren driver Lewis Hamilton, or one of the Red Bull Racing pilots consisting of Mark Webber and Sebastian Vettel who will take Formula 1 racing's great honour. Qualifying for the final 2010 Formula 1 race on the Yas Marina circuit started with Alonso's Ferrari blasting to Q1 fastest time with a 1 minute, 40.170 second time ahead of the Mercedes GP car of Nico Rosberg. The Red Bull-Renaults held close to the top times less than two-tenths of a second off the Q1 session leader. As Q2 session begun, the Toro Rosso-Ferrari of Sebastien Buemi was eliminated on virtue of Q1 times along with the new-for-2010 Formula 1 teams. The last race of the year to be declared as rookie organizations, Lotus Racing, Virgin GP and HRT have regrettably been feeding off the bottom of the Formula 1 grid almost exclusively this season without a single F1 constructor point scored so far in 2010. Battling amongst themselves, Lotus Racing has prevailed as the top runner of the three teams finding Virgin GP as a worthy adversary for many events. While lackluster results in the standings, these teams have been the constant focus off the track with news and rumours for the 2011 season. 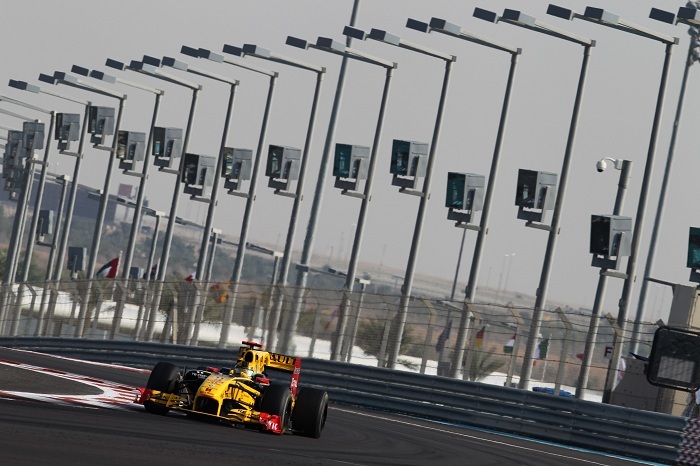 Sebastian Vettel's Red Bull-Renault would take the Q2 session lead into Q3 where he would earn the pole for the Abu Dhabi Grand Prix with a 1 minute, 39.394 second lap around the 3.541 mile track. Running the least laps in all of the top-10 drivers, the German driver Vettel hammered in his 10th Formula 1 pole of 2010 far outreaching any other competitor. Vettel's run also tallies the 15th pole position in the 19-race Formula 1 tour for Red Bull Racing team as a whole. Behind Vettel, Lewis Hamilton shot up 4 grid positions from his Q2 time to place his McLaren-powered Mercedes-Benz on the front row. Fourth place in the points championship, Hamilton is very much a long-shot for the 2010 driver's title. Since the McLaren driver is 34 points behind the lead entering the final grand prix, the only scenario which will allow Lewis Hamilton to celebrate the 2010 Formula 1 driver's title is a catastophe to his rivals for the championship. Starting 3rd is points leader Fernando Alonso who ran his Ferrari just under 4/10th of a second short of Vettel's pole time. The second McLaren-Mercedes driven by 2009 Formula 1 Driver's Champion Jenson Button slots 4th beside Alonso's Ferrari. Suffering a massive fall-off from previous the previous qualifying sessions of the day, Mark Webber could only muster a 5th fastest time at the end of Q3 placing the closest challenger to Fernando Alonso's lead safety behind the Ferrari prior to the race's start.